I have been frantically trying to finish this so I can get the completed top to the quilter by August 1. I have to assemble part of it yet. But in contemplating the pattern for the quilter, I think a SID in the star part is appropriate but the seams that radiate out from the center are pressed open, per pattern directions. Will this work?? All others are pressed to the side. Then in the lily blocks, both the three lily and the single blocks, I am stumped. I have thought of echo, crosshatching, a viney thing going up from the foliage of the lily, but don't have a pattern for that. There is to be a border added which will be the cream Shadowplay. I have a feather design for that with possibly straight stitching if it isn't wide enough running perpendicular to the feathers. I have also thought of adding like a 3" border of the cream and then a strip of the colors as a stop border before the wider outside, but haven't decided about that yet. I would surely appreciate any thoughts or inspirations. All of your creativity inspires me and I appreciate any suggestions. Thank you and have a good weekend. wow..it is stunning. I hope to one day do something like this. Sorry no help..just wanted to say I like it. Beautiful, you ladies are amazing!!!!!! It is going to be beautiful. If you are sending it to out to be hand quilted, perhaps they might have some suggestions. Maybe stitch around the flowers and then echo stitch out like Hawaiian quilts? If it was machine stitching, I would suggest a small stipple to make the flowers puff up. I imagine if you asked hand quilters to quilt a small stipple in the background around the flowers they would stare at you with looks of horror on their faces! I don't any suggestions for the quilting, but wanted to say what an amazing quilt! I love everything about it! I think echo quilting would work since it would avoid the seams. I know what you mean. The pattern shows it machine quilted, but for some reason, I thought I would get this one hand quilted. The book showed it heavily stippled around the flower blocks to emphasize them and it was very effective. When I do small projects, that SID thing is a challenge. I can only imagine what it would be on a machine!! I love this pattern, and I love your quilt. It's just stunning. Not too many hand quilter's will choose stitch in the ditch. I think that's more of a machine quilter's technique, because if you're going to hand quilt you want the stitches to show. 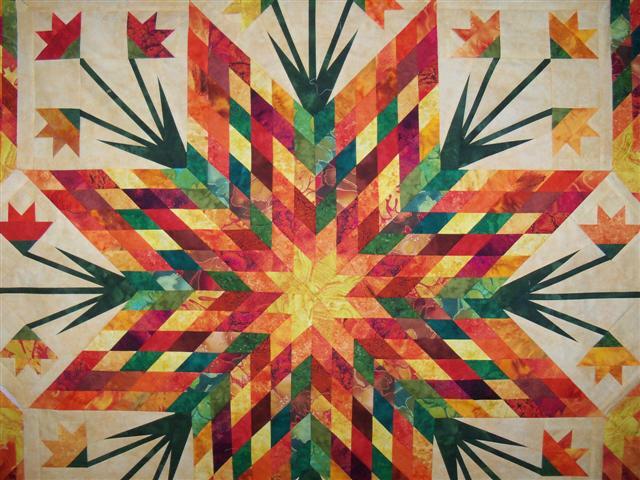 If it was me, I'd 1/4 inch quilt it inside each diamond piece of the star and around each leaf, stem, and flower. It seems like hand quilters do cross hatching for back ground, and you could do that. You could design a long slim feather motif to fit between the flowers as though it were a bit of quilted greenery in a bouquet. 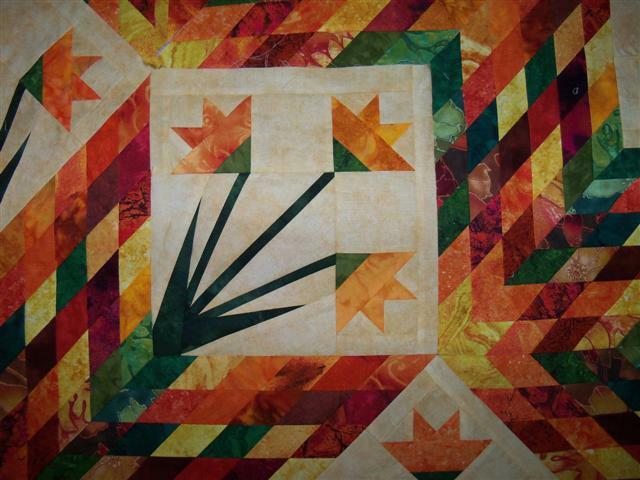 You could do a close Baptist fan motif as a back ground, oriented to cross your flower stems in each of those blocks. 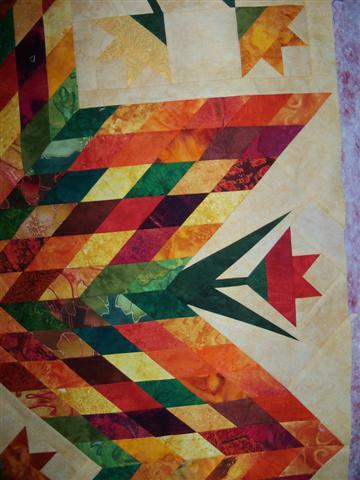 It would break at the quarter inch quilt line for the stems and flowers, but from a distance would create quilted scallops around your center star. Thank you for the suggestions. I am on the search for some of these stencils. Wish me luck. I agree with the comments that Petalpatsy made. I am a handquilter and I would have done basically what she suggested. The quilt is lovely. 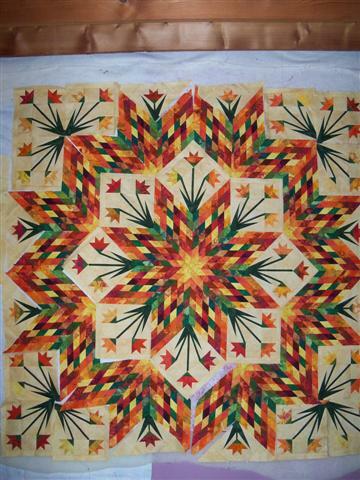 Let us see it again after the quilting is completed. Beautiful....... really super nice. You've done a fantastic job.!! If you know your handquilter, ask her. I've had a few quilts done by hand and I have gotten my quilts back loving them. They do so many that they will have great suggestions. I'm no help whatsoever but that is one gorgeous quilt!